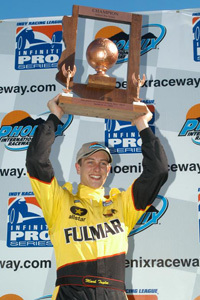 AVONDALE, Ariz., Saturday, March 22, 2003 – Infiniti Pro Series points leader Mark Taylor remained perfect in the 2003 season, capturing the Phoenix 100 on March 22, 2003 at Phoenix International Raceway for his second victory in as many starts this season. Pole winner Taylor led all 100 laps in the No. 4 Fulmar Panther Dallara, beating runner-up Thiago Medeiros to the finish by 1.0758 seconds in an incident-filled race. Tony Ave finished third, as rookies swept the podium positions. Taylor averaged 92.611 mph on the 1-mile oval in a race slowed by cautions four times for 33 laps. He padded his points lead to 104-80 over series and race runner-up Medeiros. It was only the second time in Indy Racing League history that a driver led every lap of a race. Ryan Hampton led from start to finish to win the Infiniti Pro Series race in August 2002 at Gateway International Raceway. Indeed. Taylor pulled away on each of the four restarts, building a lead as large as 4.9 seconds on Lap 83. The final caution period started on Lap 93 when Marty Roth hit the outside retaining wall in Turn 4 with the No. 3 Roth/Stewart Dallara/. He was unhurt. The caution set up a one-lap chase for the checkered, as the green flew at the start of Lap 100. Taylor stayed ahead of Medeiros and Ave entering Turn 1 and never trailed thereafter. Medeiros, who started ninth, still was happy with his second consecutive runner-up finish of the season in the No. 36 Genoa Racing entry. Ave completed a fine rally from a crash during practice Friday, earning a top-three finish in his first Infiniti Pro Series start in the No. 91 RFMS/Hemelgarn Racing Dallara. “The disappointing part for me is that I made a mistake in traffic on Friday and got in the fence,” Ave said. “Unfortunately, we lost a lot of laps. From there, the guys did such a great job. They put that thing together. We went out and it was just the same as it was before, which is amazing. Hemelgarn Racing did such a great job. Phoenix International Raceway is one of the trickiest, most unforgiving tracks in the IRL, and the IndyCar? Series has raced at the facility every year since 1996. This was the first Infiniti Pro Series race at the historic track, and its difficult layout – every corner is different – caught some of the drivers. Veterans Cory Witherill and Ed Carpenter, and rookie Tom Wood were unhurt in separate incidents.